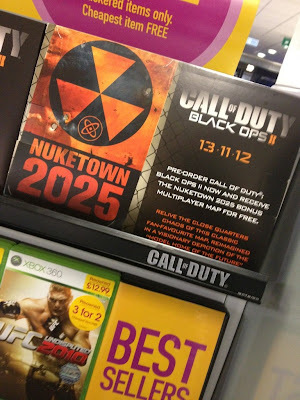 Firstly, it kind of confirms people's expectations that Black Ops 2's multiplayer will be set in the future. Although we've already been told that the single player would take place in a near-future setting, there has been no real confirmation about whether or not the multiplayer will follow the same time frame. Now that we know there will be a futuristic version of Nuketown, we can safely guess that the Black Ops 2 multiplayer will also be based on the near future. Secondly; how will people react to this? Being awarded free DLC for pre-ordering is often frowned upon by ardent gamers who feel as if publishers are already making enough money as it is. It's definitively not a subject that is without controversy. Although, it has to be said: it is much better than awarding people extra guns or perks.